Calligraphy is an art form that exists in a variety of forms. In effect, it is the art of beautiful handwriting, and there are a number of examples of calligraphy all over the world. Before the printing press was invented and it revolutionized the art of printing, all books were written and produced by hand. At that time, the art of calligraphy flourished and found expression in a variety of forms. The particularly famous ones include the Chinese and Arabic style of calligraphy. The word calligraphy literally means beautiful writing. It is derived from a combination of Greek Roots: ‘Calli’ meaning ‘beautiful’ and ‘grapho/graph/graphy’ meaning ‘to write to record’. Graphologist: a ‘graphologist’ is a person who studies handwriting. Holograph: Handwritten book or document. Lexicographer: One who writes a dictionary. You may have realized that each of the words above has a relationship to writing. The image in the poster is an example of calligraphy. It is not a hard word to remember and can simply relate it to the most beautiful handwriting you have ever seen. That specimen can be regarded as a sample of calligraphy. 1. However, Patrick’s skill in calligraphy far exceeds his skill in any other field. It is almost as if his hands have the divine gift of beauty in them. Calligraphy is artistic and very hard to learn. 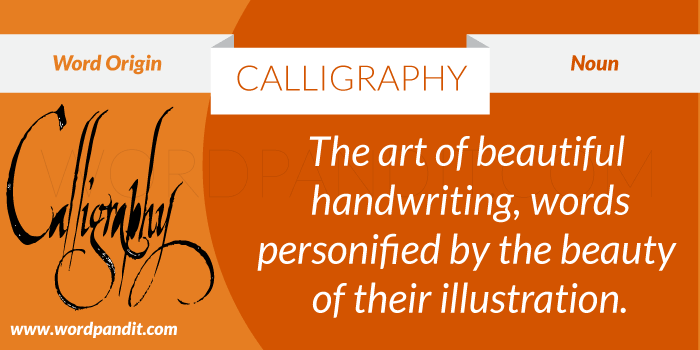 Most of the Calligraphist are born with the skill.